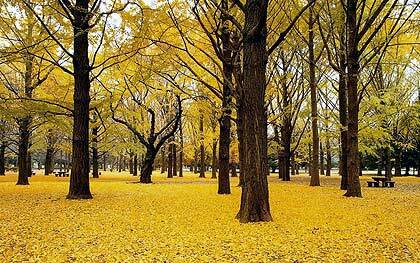 Hongcheon forest, 43,000 sq.m, has around 2,000 Ginkgo trees. Location Hongcheon, Gangwon-do Province, S. Korea. Open to the public in October. It is a popular autumn attraction in Korea. 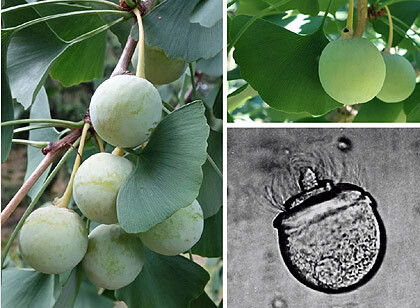 "Why would a ginkgo tree, whose seeds may be found more than a hundred feet in the air, resort to swimming sperm to find a mate? The answer is rooted in history. The ancestors of all land plants (green algae) had swimming sperm that sought out (swam to) eggs to create the next generation. A pretty good idea if you live full time in the water. Amazingly, after all of these years (475 million, to be precise, since the first green algae colonized land), sperm of ginkgo trees, cycads, ferns, horsetails, mosses, and other groups of plants still find their egg-mates by swimming, tracking the chemical signals that the conspecific (same species) egg is emitting to attract a suitor. Truly, this is a vestige of evolutionary history." More info on my website: History-page + Propagation-page and Ovule-page.